Indiana University-Purdue University-Indianapolis received a A.
U.S. News & World Report's ranking of 74 out of 268 of National Universities High School Counselor Rankings was a major contributor to this grade. "Large, public Indiana University Purdue University Indianapolis - a real mouthful, so it's IUPUI for short - offers 180 Indiana University and Purdue University degrees in the "urban, engaged, and energized" environment of Indianapolis. More than $67 million in financial support is provided to undergraduate students here through scholarships, grants, loans, and work study programs." Describe the type of student who should not attend Indiana University-Purdue University-Indianapolis and explain why. Describe the type of student who should attend Indiana University-Purdue University-Indianapolis. Why? What is a typical Indiana University-Purdue University-Indianapolis student like? Describe the type of person that should attend Indiana University-Purdue University-Indianapolis. What are the top 3 reasons someone should attend Indiana University-Purdue University-Indianapolis? What was a typical Indiana University-Purdue University-Indianapolis student like in high school? Describe the type of person that should attend Indiana University-Purdue University-Indianapolis. Welcome to Indiana University-Purdue University Indianapolis, ranked third in "up and coming" American universities that U.S. News and World Report says people should be watching, and the 8th best public college in the Midwest according to Forbes; home of nationally-ranked programs in nursing, public and environmental affairs, law, and health; and a campus renowned for service learning and civic engagement. 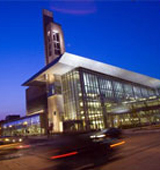 IUPUI is Indiana's premier urban university, with 21 schools and academic units which grant degrees in more than 200 programs from both Indiana University and Purdue University. Its location within blocks of downtown Indianapolis facilitates advancement of research and teaching, and presents unique opportunities for internships, partnerships, community engagement, and more. IUPUI enrolls more than 30,000 students representing all 50 states and 122 countries. Join us, and see how IUPUI is where IMPACT is made. What are the top 3 things that students do for fun at Indiana University-Purdue University-Indianapolis? 40% of students received Pell Grants, which are provided by the U.S. government to students from middle and lower income families. It gives you an idea of a school’s socio-economic diversity. Campus housing is available for undergraduates. Housing deposit : $50.00. Housing deposit due : May 1. Housing deposit is not refunded if student does not enroll.. Freshman allowed to have car. No pets. 6% of students live on-campus. 28% of freshman live on-campus. A program that focuses on the creative aspects of the blending of music and technology; and that prepares individuals to apply technical knowledge and skills to the composition, recording, synthesis, and performance of music; audio-visual production; scoring for film and multimedia; and software and multimedia development. Includes instruction in music theory, music history, composition, acoustics, recording technology, computer composition, electronic music synthesis, technology-based performance, 3D sound and spatial audio, and music business and law. A program that focuses on the study of various aspects of work, labor organization and policy, and labor movements from the perspective of the social sciences and history. Includes instruction in labor history; political and ideological issues; worker movements and social organizations; civil rights; labor law and policy studies; labor economics; international and comparative labor studies; and applications to specific industries, groups, locations, and time periods. Analyze and coordinate the logistical functions of a firm or organization. Responsible for the entire life cycle of a product, including acquisition, distribution, internal allocation, delivery, and final disposal of resources. Directly supervise and coordinate the activities of mechanics, installers, and repairers. Directly supervise and coordinate the activities of production and operating workers, such as inspectors, precision workers, machine setters and operators, assemblers, fabricators, and plant and system operators. Any program in business information and data processing services not listed above. A program that prepares individuals to work with pathologists to detect changes in body cells that may indicate, and permit diagnosis of, the early development of cancers and other diseases. Includes instruction in biochemistry, microbiology, applied mathematics, microscopy, slide preparation, identification of cellular structures and abnormalities, and laboratory procedures and safety. A program that prepares individuals, under the supervision of physicians, to employ radioactive and stable nuclides in diagnostic evaluations and therapeutic applications while monitoring for patient health and safety. Includes instruction in nuclear physics, health physics, instrumentation and statistics, biochemistry, immunology, radiopharmacology, radiation biology, clinical nuclear medicine, radionuclide therapy, computer applications, safety regulations, equipment operation, quality control, laboratory procedures, taking patient histories, patient evaluation and monitoring, emergency first aid, administration and record-keeping, and personnel supervision. Any instructional program in public health not listed above. A program that prepares individuals, under the supervision of health physicists, occupational safety and health specialists, and public health officials, to monitor and control radiation exposure and implement preventive measures in health care, work, and natural environments. Includes instruction in radiation physics, environmental radioactivity, radiological instrumentation, electronics of radiation detection equipment, radioactive waste management and control, safety and handling procedures, decontamination procedures, radioactivity testing and analysis, and communications skills. Assist nuclear physicists, nuclear engineers, or other scientists in laboratory or production activities. May operate, maintain, or provide quality control for nuclear testing and research equipment. May monitor radiation. Collect data on work environments for analysis by occupational health and safety specialists. Implement and conduct evaluation of programs designed to limit chemical, physical, biological, and ergonomic risks to workers. A program that prepares individuals, under the remote supervision of physicians, to recognize, assess, and manage medical emergencies in prehospital settings and to supervise Ambulance personnel. Includes instruction in basic, intermediate, and advanced EMT procedures; emergency surgical procedures; medical triage; rescue operations; crisis scene management and personnel supervision; equipment operation and maintenance; patient stabilization, monitoring, and care; drug administration; identification and preliminary diagnosis of diseases and injuries; communication and computer operations; basic anatomy, physiology, pathology, and toxicology; and professional standards and regulations. A program that prepares individuals, under the supervision of histotechnologists and other clinical laboratory scientists, to prepare and process tissue samples and perform routine histologic procedures and tests. Includes instruction in fixation, dehydration, embedding, sectioning, decalcification, microincineration, mounting, routine and special steaming, laboratory mathematics, laboratory procedures and safety, instrumentation and microscopy, computer applications, preparation of museum specimens, and recording and administrative procedures. A program that prepares individuals, under the supervision of physicians, to provide medical imaging services to patients and attending health care professionals. Includes instruction in applied anatomy and physiology, patient positioning, radiographic technique, radiation biology, safety and emergency procedures, equipment operation and maintenance, quality assurance, patient education, and medical imaging/radiologic services management. A program that derives from two or more distinct programs and that is integrated around a unifying theme or topic that cannot be subsumed under a single discipline or occupational field. A program that prepares individuals to apply basic engineering principles and technical skills in support of architects, engineers and planners engaged in designing and developing buildings, urban complexes, and related systems. Includes instruction in design testing procedures, building site analysis, model building and computer graphics, engineering drawing, structural systems testing, analysis of prototype mechanical and interior systems, test equipment operation and maintenance, and report preparation. A program that prepares individuals to apply basic engineering principles and technical skills in support of engineers engaged in developing biological or medical systems and products. Includes instruction in instrument calibration, design and installation testing, system safety and maintenance procedures, procurement and installation procedures, and report preparation. Test, adjust, or repair biomedical or electromedical equipment. A program that focuses on the application of the biological sciences, biochemistry, and genetics to the preparation of new and enhanced agricultural, environmental, clinical, and industrial products, including the commercial exploitation of microbes, plants, and animals. Includes instruction in bioinformatics, gene identification, phylogenetics and comparative genomics, bioinorganic chemistry, immunoassaying, DNA sequencing, xenotransplantation, genetic engineering, industrial microbiology, drug and biologic development, enzyme-based production processes, patent law, biotechnology management and marketing, applicable regulations, and biotechnology ethics. A program that prepares individuals to apply basic engineering principles and technical skills in support of computer engineers engaged in designing and developing computer systems and installations. Includes instruction in computer electronics and programming, prototype development and testing, systems installation and testing, solid state and microminiature circuitry, peripheral equipment, and report preparation. A program that focuses on computer systems from a user-centered perspective and studies the structure, behavior and interactions of natural and artificial systems that store, process and communicate information. Includes instruction in information sciences, human computer interaction, information system analysis and design, telecommunications structure and information architecture and management. A program that prepares individuals to apply technical knowledge and skills to develop working drawings and electronic simulations in support of mechanical and industrial engineers, and related professionals. Includes instruction in manufacturing materials and processes, mechanical drafting, electrode-mechanical drafting, basic metallurgy, geometric dimensioning and tolerancing, blueprint reading, and technical communication. Any instructional program in mechanical engineering-related technologies not listed above. A program that prepares individuals to apply basic engineering principles and technical skills in support of engineers and other professionals engaged in developing and using robots. Includes instruction in the principles of robotics, design and operational testing, system maintenance and repair procedures, robot computer systems and control language, specific system types and applications to specific industrial tasks, and report preparation. A program that prepares individuals to apply technical knowledge and skills to develop working drawings and electronic simulations for architectural and related construction projects. Includes instruction in basic construction and structural design, architectural rendering, architectural-aided drafting (CAD), layout and designs, architectural blueprint interpretation, building materials, and basic structural wiring diagramming. The average student pays $12,713 for tuition, fees, and other expenses, after grants and scholarships. Total stated tuition is $7,750, in-state and on-campus, before financial aid. 63% of students receive some form of financial aid. Learn more about financial aid at http://www.iupui.edu/~finaid/. Estimate the net price for you at http://npc.collegeboard.org/student/app/iupui. 14% of students graduated on time. 41% of students graduated in six years. 72% of full time students continued studying at this school after freshman year. The typical (median) early career salary of Indiana University-Purdue University-Indianapolis graduates is $42,200, according to Payscale. Indiana University-Purdue University-Indianapolis participates in the NCAA Division I-AAA for college athletics. Want more info about Indiana University-Purdue University-Indianapolis? Get free advice from education experts and Noodle community members.